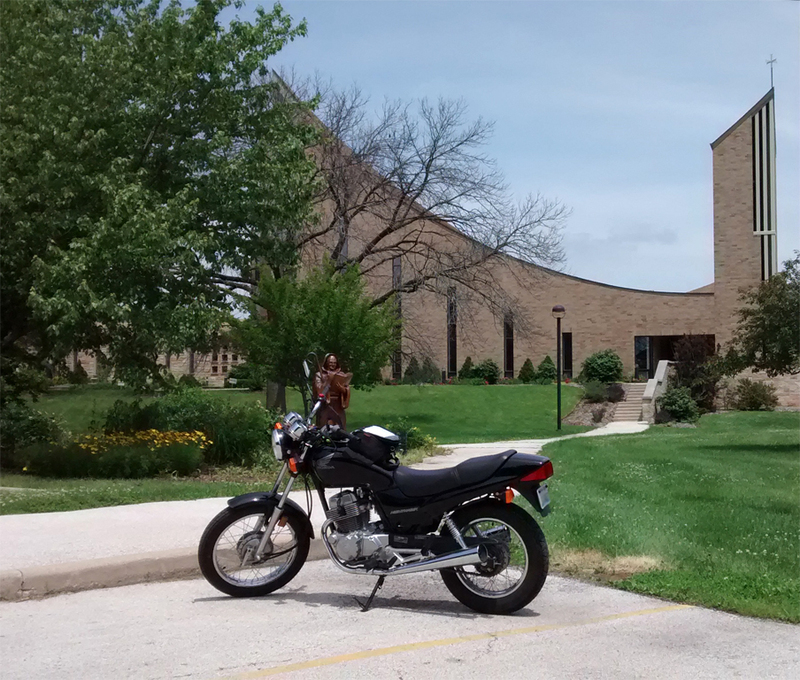 Another stop on my ride last weekend was at Marmion Academy. It’s an all-boys Catholic school situated on a lush expanse of property in Aurora. It’s a very pretty campus with several idyllic places for reflection tucked away in the trees surrounding it. According to their website, Marmion Academy was founded in 1933 by a handful of Benedictine monks. 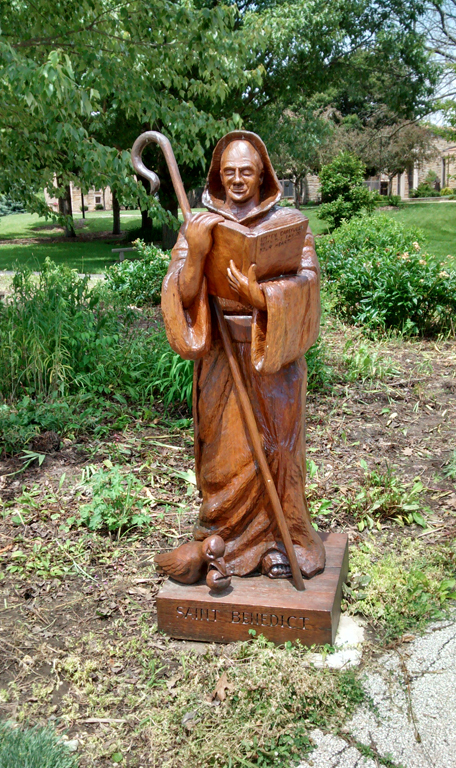 The “Marmion” moniker comes from the name of an abbot, Columba Marmion, in whose honor the school was named. The Marmion Abbey church is an interesting piece of architecture. I don’t think I’ve seen any other buildings quite like it. It sort of looks like the pope’s hat, in a way. 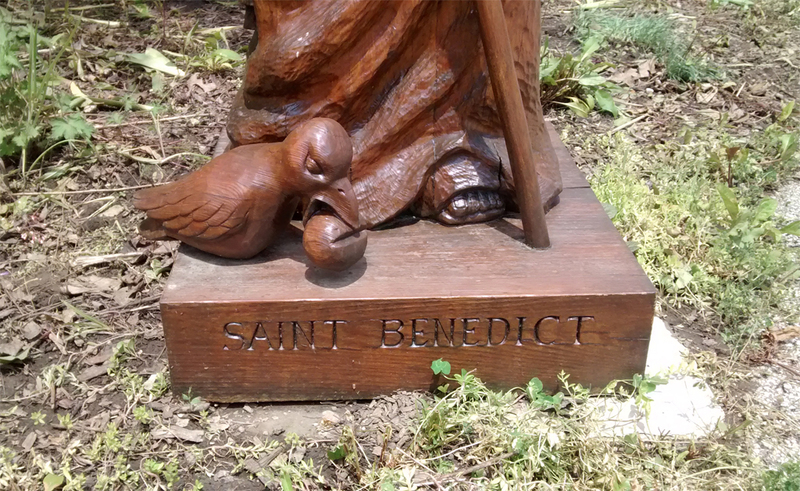 In front of the church is a wooden carving of Saint Benedict, founder of the Benedictine order. A fascinating story in its own right, but I also found it particularly interesting because I had recently read The Maltese Falcon. If you’re unfamiliar with the story, the elusive falcon is a “black bird” statue which is worth a lot of money. The characters in the story go to great lengths to obtain this statue, including theft, bribery, lying, betrayal, and even murder. We eventually find out (SPOILER!) that the statue is actually made of gold and encrusted with jewels, but one of its previous owners covered it with black enamel in order to disguise its real value from potential thieves. I think this is an interesting parallel, and perhaps why Dashiell Hammett chose to use a “black bird” as the object of desire as opposed to any other figure. Desire for the statue corrupts nearly everyone who hears about it, except for one person, Sam Spade. Though, ironically, he is no saint.